The following Q&A will help you get familiar with the Act and how to use it. Every Indian should know about RTI filing.The procedure to File RTI is simple and hassle-free. Write the application (or get it typed, your choice) on a paper in English/Hindi/the official language of the state. Some states have prescribed format for RTI applications. Address it to the PIO (Public Information Officer) of the department concerned. Ask specific questions. See to it that they are clear and complete, and not confusing whatsoever. 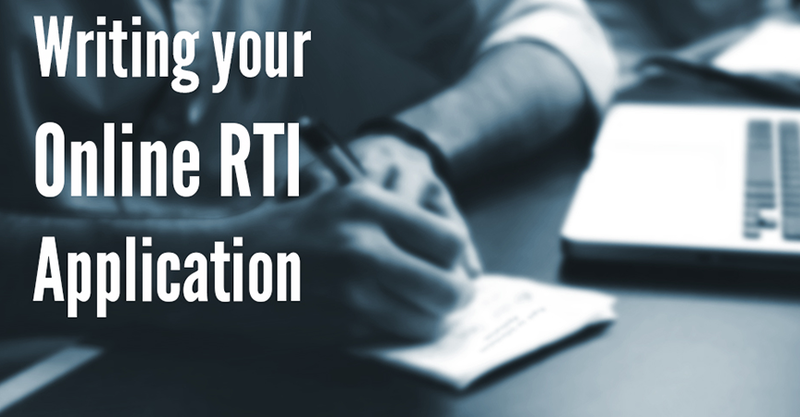 Write your full name, contact details and address, where you want the information/response to your RTI be sent. Take a photocopy of the application for your record. If you’re sending the application by post, it’s advisable to send it via registered post, as then you will have an acknowledgement of your request’s delivery. If you’re submitting the application to the PIO in person, remember to take an acknowledgement from him/her. The Act is so people-friendly that if an illiterate person approaches a PIO and wants some info under the RTI, he/she can tell his requirement to the PIO and the officer is obliged to write it down for them and read it to them before processing it. One need not write the application on a clean sheet of paper. Even a crumpled, old, torn piece of paper will do, so long as your written content on it is legible. Until the RTI Act empowered the common man to demand information from government, only the members of Parliament had the privilege of seeking this information. If you are hesitant about sending your RTI application by post and can’t take a day off work to catch hold of the PIO concerned, you can go to your post office and submit your application to the assistant PIO. The postal department has appointed many APIOs across its many offices. Their job is to receive RTI applications and forward them to the PIO or appellate authority concerned. How to File Online RTI? Currently, Central and a few State government departments have facility for filing Online RTI. However, there are multiple independent websites that let you file your application online. They charge you a nominal amount, for which they draft your application and send it to the relevant department. This is as good as sending an RTI application without having to worry about the particulars. Which Government Organisations are required to give RTI information under RTI Act? All government agencies, whether they are under a state government or the Centre, come under the purview of the Act. For example, Municipal Corporations, PSUs (Public Sector Units), Government departments, Ministries at the State as well as Central level, Judiciary, Government owned Companies, Government Universities, Government Schools, Works Departments, Road Authorities, Provident Fund department etc. The list is quite an exhaustive one. You can ask a government how much money is being spent on renovation of its ministers’ bungalows, what their telephone bill or fuel expenditure is. Or you can ask what amount was spent on MLAs’/MPs’ foreign trips. You can ask how much of allocated money your elected representatives have utilised on improving their constituency; you are entitled to ask for even a break-up of the amount spent, project-wise. This RTI information is available because it is the taxpayers’ money that is being spent here. Few ministries and departments make online rti replies available to the public. You can see them on the respective websites. Not only governments and their departments, but also smaller units such as your city corporation or gram panchayat fall under the ambit of RTI. Be it police, passport office, your electricity/water supply company or even the IRCTC, all are required to furnish RTI information. Through RTI, we can get copies of government documents such as records, advices/opinions, reports, papers, file notings. Even email communications and data held in electronic form has to be made available to citizens upon an RTI application. We can even go to the department’s office and inspect their records and documents, if at all the RTI information is voluminous you can take photocopies, obtain certified copies, take printouts and what not. Which Government Departments are exempted from the Act? Twenty-odd organisations are exempted from RTI. But all these entities are related to the country’s defence and intelligence, such as RAW, BSF, CRPF, CISF, Intelligence Burearu, National Security Guard etc. However, RTI law says that any information which cannot be denied to a Member of Parliament or state legislature cannot be denied to any citizen. How to use RTI to solve personal problems? Be it never-ending delay in dispatch of passport or police dilly-dallying in giving you a copy of FIR you might have filed, submit an RTI application asking pointed questions. Highly likely this will be the beginning of the end of your woes. Pending income tax return, pension’s release, withdrawal or transfer of PF, release of Aadhaar card or issuance of property documents or driving licence. Using the RTI tool in any of these scenarios—or other cases involving a government agency—will guarantee you an official response, based on which you can take things further if your issue is not solved. Please provide daily progress done on my passport application. Please provide names of officers with whom my application has been lying during this period. Please inform as per your citizen’s charter in how many days I should have got my passport. How powerful is RTI Act and how is RTI any different from other anti-corruption laws? When it comes to RTI, there are watchdogs on multiple levels to ensure the Act is followed in letter and spirit. The Act has employed a ‘perform or perish’ approach, besides setting up a mechanism to dispense information. Every government organisation is needed to appoint one employee as a public information officer (PIO). Once a department gets an RTI request, it is the responsibility of the PIO to furnish the information to the applicant within 30 days. Failing to do so means, a monetary fine can be imposed on the PIO. The longer a PIO makes an applicant wait, the more the penalty levied on him/her. There have been instances where PIOs have been asked to cough up amount in thousands of rupees as fine. Every state has an Information Commission, comprising a Chief Information Commissioner and a few information commissioners. Former judges, IAS, IPS officers of impeccable record are appointed to these positions by the government. Above them in the hierarchy is the Central Information Commission and below them are first and second appellate authorities to see to it that an applicant does get the RTI information he/she has requested. How many days does it take to get RTI response? As per law, the RTI information should be provided in 30 days. However, sometimes government records are misplaced or missing. Or the agency you’ve written to needs to co- ordinate with another department to provide you the information you want. In such situations, the information may take more than 30 days to arrive. In such case, the PIO concerned needs to send you a written intimation about the possible delay and the reason. If he/she fails to do so and you don’t receive the info within 30 days, penalty can be levied on the PIO if the matter taken up with appellate authorities. What is the fee for seeking information under the RTI? For central government departments one needs to pay Rs. 10 with every RTI application. Mode of payment may vary from government to government. While submitting application in person, some organisations accept cash while some do not. Some ask for Court Fee Stamp, some ask for Indian postal order (IPO). When sending an RTI application by post, we can use IPO/ court fee stamp of Rs. 10. Those below poverty line (BPL) do not have to pay Rs. 10 as fee for filing an RTI. If you’ve asked the government office to furnish copies of some records, you will need to pay Rs. 2 per page. Once the office receives your request and ascertains the amount you will need to pay towards making copies, you will get intimation via post. You can make the payment by sending postal order/court fee stamp/demand draft of the said amount. Is RTI act different for different states? The central government has come up with RTI act which is applicable in all states except Jammu and Kashmir which has its own act very similar to central act. Each state has extended central act with state specific rules which contain rules on RTI fees, mode of payment, RTI application form and sometimes a limit on number of words or questions. In the following table, we have summarized rules of different states and also provided link to copy of respective rules. Is the form compulsory ?